Where can you read the latest evidence-based health advice, followed by a dramatic real-life tale of survival in the oceans? Where can you pore over beautiful photos of ancient cultural traditions and, on the next page, have a chance to win £50 with a prize question? Where can you read the personal memories of a well-known figure, and then receive top travel tips about a must-see destination? Reader's Digest has been the source of all of this — and much more — for 95 years. During the First World War, a young American soldier was recuperating from a shrapnel injury in France. DeWitt Wallace, a copywriter by trade, spent four months reading magazines as he recovered — and it gave him an idea. Returning to New York, he decided to create a magazine that was a compilation of all the best articles from other publications. The first issue of Reader's Digest was printed in 1922, and it went on to reach a global audience of millions in dozens of worldwide editions. The first UK edition of Reader's Digest hit the shelves in March 1938, and we've produced an edition for eager readers every month since then. In the spirit of DeWitt Wallace's curated approach, we proudly remain a compendium of advice, true-life tales and human-interest stories that traverse cultures. As a magazine brand, we are unique in that our global editions share both stories and writers — you can read about Paris cafes written by a true Parisian, learn about the Great Barrier Reef from those working in Australia to preserve it, or gain an insight into the Hungarian wine industry from those who are there nurturing the vines. In a world where you can't always believe what you read, we are rigorous in our research. Our health features, in particular, are known for their meticulously checked statistics and contributions from world-renowned experts. When we tell you how to avoid developing diabetes, for example, you know the advice has come from leaders in the field. We are also recognised for our financial advice, and are often the first port of call for those seeking guidance on a monetary decision. We celebrate what makes life full and what connects us. One month we'll speak to couples who found each other later in life and are gloriously happy, while the next month we'll hear from a man who defied death while stranded in the African bush. These snapshots into lives around the world are designed to open our minds, cultivate an interest in others and make us reflect on what makes us content in our own lives. We also speak to those who are in the public eye but, in contrast to many other media outlets, we're not concerned with salacious stories. We want to know what makes that person who they are, how they've achieved their successes and what advice they'd pass on to others. In all our features, we find the human. While we cherish the luxury of print, we also admire the convenience of online — and cater for all platforms. 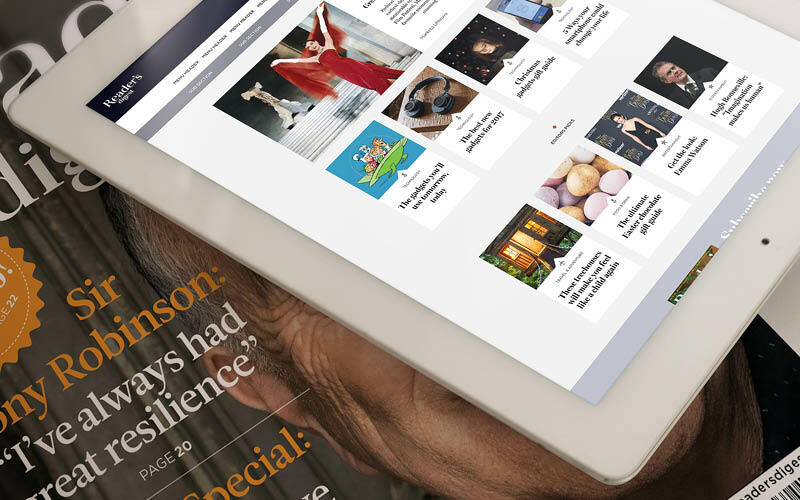 Along with our award-winning print edition, we have a vibrant online presence to at readersdigest.co.uk, along with an easy-to-use app. We are living in age of information. Click your fingers (or click a button) and you can find the answer to almost any question. Research suggests, however, that this information overload isn't making us happier. Quite the opposite, in fact — it's making us more stressed and more cynical. Reader's Digest was, in effect, a form of the internet before it even existed. It was a compendium of the best advice, the best stories and a way of connecting people through common interests. The difference was that it was a medium you could trust — and you still can. Our mission is to remain true to our values of knowledge, humour and positivity. We want to celebrate what we can learn from each other — be that how to lower your cholesterol, how to make a relationship work or even how to tell a good joke. We also want to be a respite for your mind. In picking up a copy of Reader's Digest, you can get away from the clickbait, the sensationalism and constant updates — and lose yourself in quality. Whether reading our print or online articles, Reader's Digest gives you the chance to have a quiet moment, learn about an interesting topic, and come away better-off for it. So what can you expect from every edition of Reader's Digest, or from a visit to readersdigest.co.uk? We will always stand for integrity and quality. We aim to make your day a little bit more interesting, your year a little bit more informed — and your life a little bit richer.